Facebook ads are all the rage right now in the marketing community—and for good reason! It’s easier than ever to reach a bigger, broader audience and give yourself the chance to help more people. But a lot of you are making a few big mistakes when it comes to marketing your business online. The way most people are using Facebook to get more leads and clients is very similar to asking someone to marry you the first time you meet them. Sure, you might find that weirdo who says yes, but you’ll be a lot more effective if you take a little time to date them first. All the ads going around Facebook for fitness businesses seem to be promoting a challenge, contest, or some type of offer. That’s great, and honestly, it will work alright for you because your competition isn’t that tough in your local market. 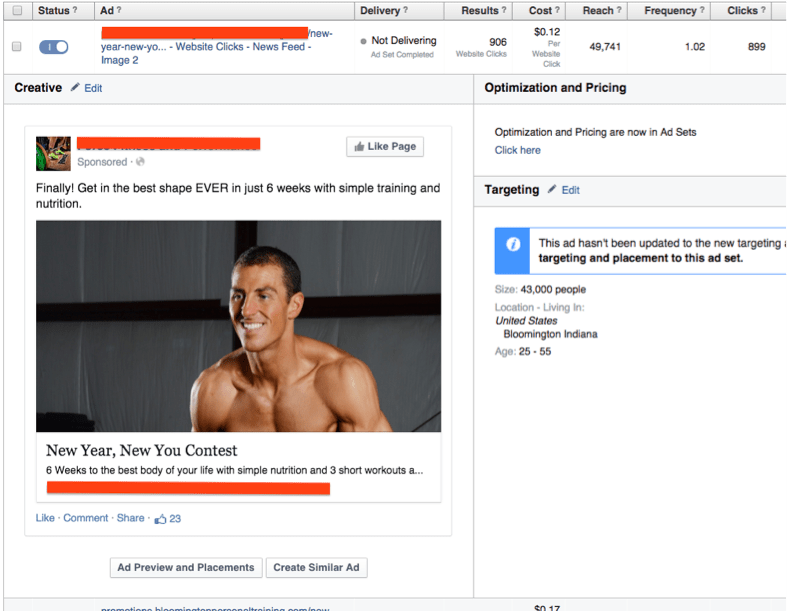 Even if several other gyms are marketing via Facebook in your area, it’s fairly easy to target people and not have them be overwhelmed with ads. But what if I told you there was a better way to generate leads, and a lot more of them, with your Facebook marketing? The key to Facebook marketing success is getting someone from what I will call the “Know” you stage to the “Like” or “Trust” you stage. You do that by engaging with them and moving the conversation from Facebook (where they are being bombarded with information) to email and eventually to offline communication. Yeah, yeah—you still have to interact with people in this business! It’s no secret that Facebook keeps most of your content, especially from your business page, out of sight from most of your fans and the people you want to reach. They know they can get you to dig into your wallet and pay to get exposure. That’s OK, as long as you have a plan to get a return on your investment. 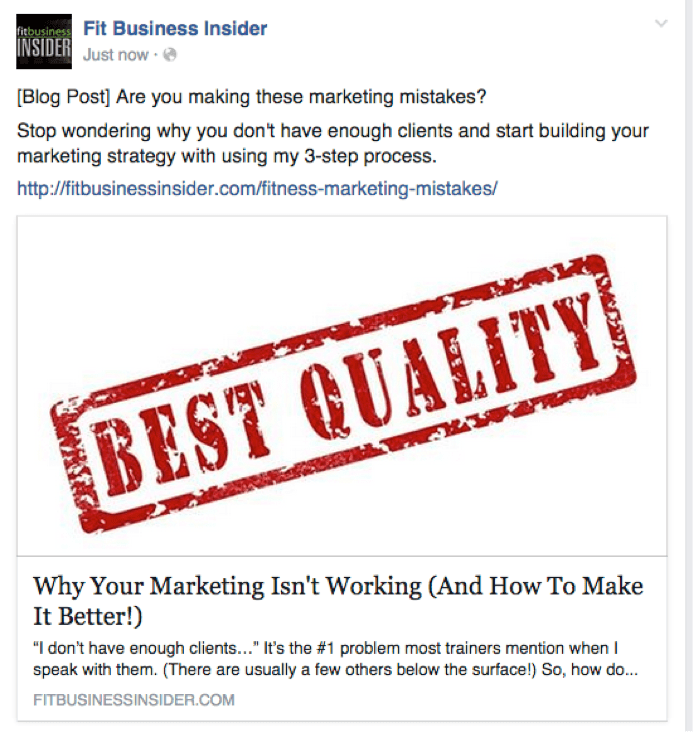 When boosting a Facebook post you need to have some direction and a purpose for it. The purpose is to get them to do something. You need a strong call to action on any boosted post. That could be a call to action to click a link or to accept an offer. The best bet for big results is to promote a post to a blog post that you write covering one of the key concerns for your ideal client. A blog post can cover a free workout, a case study of a successful client, or a controversial topic. The goal is to start to make a new audience aware of what you offer by providing them with some value. Inside of this blog post you can place graphics or links to an opt-in gift to get them on your email list. The content in the status update has “[Blog Post]” in it so the reader immediately sees that it’s something they might want to check out. 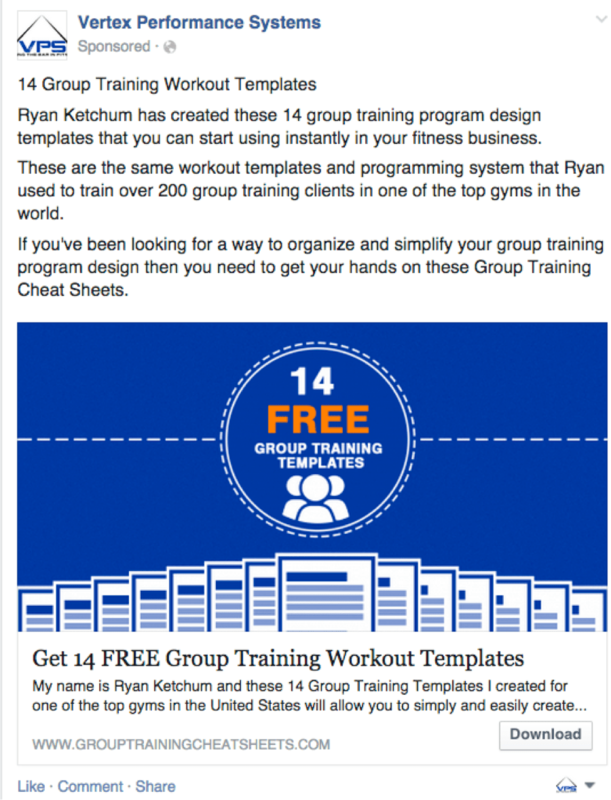 The headline and copy hits on a soft spot for most trainers: How to get more clients. The picture gets your attention. To optimize the blog post, you would want place an opt-in offer within to get people who read to give you their email address. When boosting your post, you want to narrow your audience so you have the best chance of getting it in front of the right people. Usually, this means selecting “People who like your page and their friends” and narrowing your list to your city. Now that you are getting a little more adventurous with your Facebook marketing, it’s time to start dabbling with ads. It’s recommended that you download Power Editor (link: https://www.facebook.com/help/162528860609436/) to get the most out of your ads. Getting your ads to your local market isn’t challenging. You can narrow your audience to individuals who are of a certain age range, live in a certain area, and have certain interests. If you’ve done your homework and have created a profile of your Ideal Client, then you’ll know how to target the right audience. The key to a good Facebook ad involves the same elements as a boosted post. You need a good headline, good text, and a compelling call to action. Offer to give them free workout videos you’ve filmed on YouTube, a recipe book, a 7-Day Diet Plan, etc. The list can go on forever, and you probably have dozens of possible opt-in gifts that would be appealing to your Ideal Client created already. Once you click on the ad, it takes you to a simple landing page asking for your name and email in exchange for the group training templates. It’s very simple to set up and perfect for a large segment of our audience. If you’ve followed the steps in the process so far, you are generating some new interest and collecting new leads via your opt-in gifts. The key now is to engage with those new leads. The first and easiest step is to build a short autoresponder series that delivers your best blog content and testimonials to the new lead. You want to build value in what you are offering and establish your expertise. Your blog content will show the lead that you have valuable information, and your testimonials will help them relate to your clients and see that you deliver results. This autoresponder series can be 5-10 days long, and it’s critical to moving the lead from the “Know” you stage to the “Trust” and “Like” you stage. Here’s the fun part! Now that this individual is on your list and you’ve collected their email address (and hopefully set up some tracking pixels to target them with ads later), you can start sending them ads for your front end offer. If you’re not familiar, a Front End Offer is the low-barrier-to-entry experience that you give people to test out your program. Trials, Jump Starts, or Challenges work great for these front end offers. Now you are putting a relevant offer in front of an interested audience, which means you’ll save money on getting conversions! Another great way to make money with your Facebook ads is to target people already on your email list. It’s easy to create an audience by exporting your email list and sending directly to them. You can send to those on your list who aren’t clients, old clients you want to get back, or just people who aren’t opening your emails anymore to get them re-engaged. These people are where you can spend more of your marketing budget and get a high ROI. The best part about this simple Facebook marketing system is that you don’t have to be a tech whiz to get it rolling. If you have a few bucks to invest towards marketing, you can get a lot of bang for your buck. When you have the right marketing strategy you don’t have to compete for clients anymore…seriously!